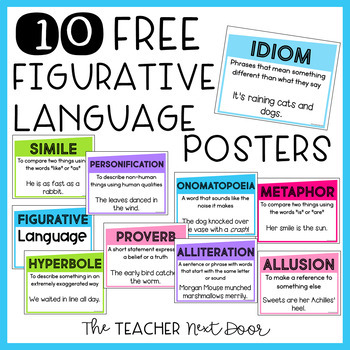 These 10 Figurative Language Posters are a great way for you to introduce different types of figurative language and can also be displayed in the classroom and used as a reference for your students. 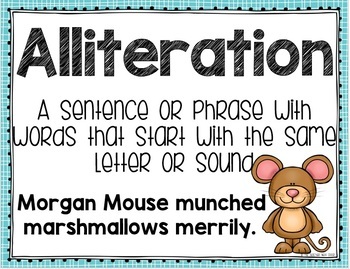 There is a poster for each type of figurative language including similes, idioms, metaphors, hyperboles, proverbs, allusions, alliterations, personifications, and onomatopoeias, as well as a title poster that says Figurative Language. It has teaching pages, a flip book, 32 task cards, and worksheets and a quiz to target figurative language. These posters are also included in that unit! 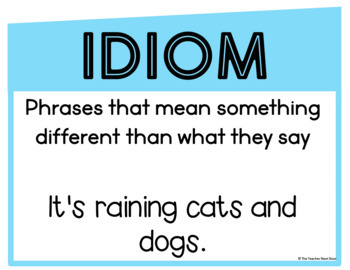 Only focusing on idioms? You might want to check out this deeply discounted three set bundle with 96 task cards! Finally, if you like my work, I would love for you to follow me by clicking on the green star at the top of the page. 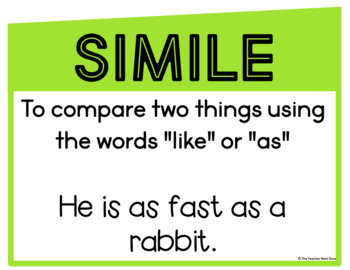 Feel free to share this freebie with other teachers but please do not post it anywhere online. Thanks for your understanding!